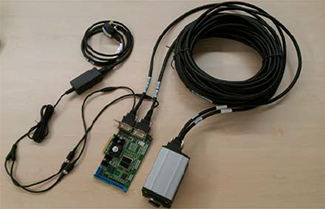 This tech note details the accessory required to extend the maximum cable distance between the Neo or Zyla sCMOS camera and the frame grabber card, by using active Camera Link cable. An active cable contains circuitry which is separately powered to augment the carried signals for transfer over long distances. 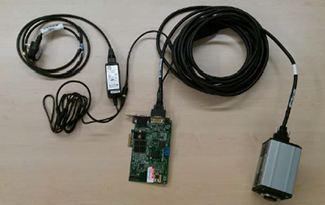 The sCMOS platforms use Camera Link format cable(s) to transfer the image data from the camera head to the PC. The maximum distance which can be achieved with a standard Camera Link cable between the camera and the frame grabber is 5 meters, due to the high bandwidth requirements of the Camera Link protocol. When using an active cable it is possible to extend this distance. Active cables with lengths up to 10 meters have been verified for all the sCMOS camera systems. The following diagram illustrates the ‘BitMaxx’ 10 meter active Camera Link cable used in both ACC-ASE-06931 and ACC-ASE-06962. The cable(s) only require a single power source which can be plugged into the power connector on the PC/Frame Grabber end of each of the cables. A separate power supply unit and mains power lead is provided with the cable(s). When connecting the cable connectors care should be taken to ensure the correct orientation of the cable, as it has a polarity thus can only operate in one orientation. The cable’s end connectors are labelled “Frame Grabber” and “Camera” respectively to indicate correct orientation. They are the same connector format as a standard Camera Link cable. To mount, insert the ends into the appropriate socket and secure in place with their connector screws. Power up the active cable/s. This cable provides the same connectivity and functionality as the standard 3 meter option. The ACC-ASE-06962 is only suitable for the 10 tap Zyla (‘X’ model) camera systems. The ACC-ASE-06931 is only suitable for the 3 tap Neo and the 3 Tap Zyla (‘V’ model) camera systems. 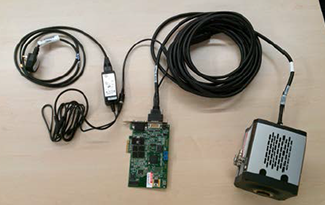 It is not possible to use the active Camera Link cables in a ‘daisy chain’ configuration. Additional splitters and repeaters have not been validated with this cable option.